The title and first look of Dhanush's next film was revealed at 7 pm tonight. The movie is titled as 'Thodari' which translates to 'train' in English. Very beautiful Tamil title indeed. It has undergone many name changes. At first it was titled temporarily as Rail, which was later changed to D30. Now, the actual name has finally been unveiled along with the first look. Sources told us that most portions of the film are shot in and around a train as Dhanush, the hero, is a pantry worker in a the movie. The first look of the movie was released online, and it has received some very positive reviews from the Tamil movie buffs. 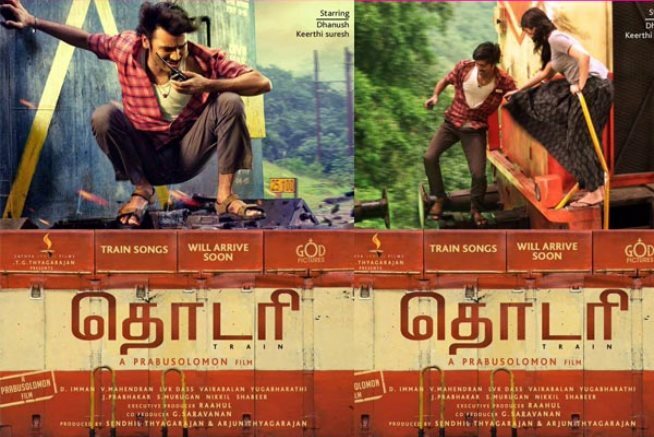 The first look posters of Thodari has Dhanush on the edge of a fast moving rail car, as he grips to the train and speaks into the walkie-talkie holding in other hand. Suiting the situation, there is a look of panic on Dhanush’s face and is holding on to the train with the other for dear life. His attire suits that of a railway caterer. The second poster gets even more romantic and adventurous as we see Dhanush and Keerthy Suresh actually jumping between two compartments! It definitely looks like Thodari is going to live up to its genre of thriller. Another thing to note about the poster that it will remind you a little of Burning Train. Imman has composed the music for 'Thodari'. Sathya Jyothi films had bankrolled the film.